An US passenger train that derailed in Washington state was traveling 80 miles (130 km) per hour in a 30 mile-per-hour zone, according to data from the train's rear engine. At least three people were killed and 100 injured after the train derailed while crossing a highway bridge near the town of DuPont. The Amtrak 501 train was the first high-speed commuter service to use the new track from Seattle to Portland, launched on Monday morning. About 77 passengers and seven crew were aboard when thirteen of the fourteen carriages tumbled onto the road. Five vehicles and two trucks were hit and the highway was littered with fragments of the bridge and tree branches. Some motorists were injured but none died, authorities said. Several hours after the 7:34 a.m. (1534 GMT) crash, train cars remained dangling from the overpass, with others strewn across Interstate 5, a major West Coast route stretching from the Canadian to Mexican borders. 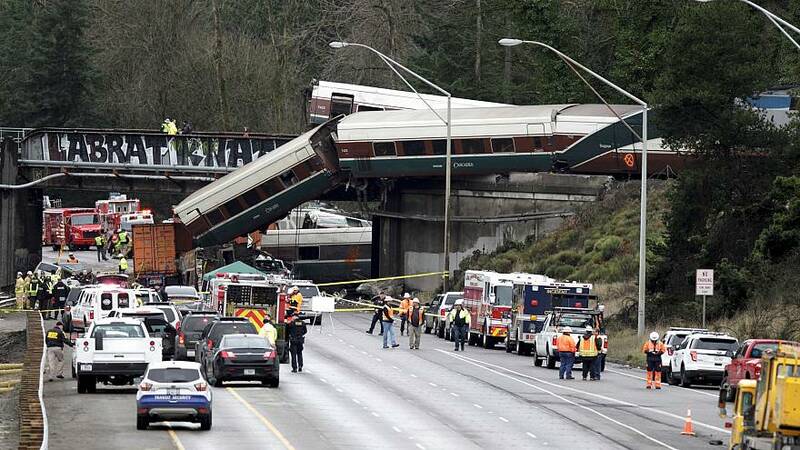 The derailment occurred on the first day Amtrak trains began using the new inland route between the Washington cities of Tacoma and Olympia, part of a 154 million euro ($181 million) project to cut travel time. It's still not clear what caused the train to derail but the The National Transportation Safety Board are investigating. Amtrak have confirmed that positive train control (PTC), a system that automatically slows trains if they are going too fast, was not installed on the tracks. By law, PTC must be installed on all passenger rail systems by 2018, a deadline that has repeatedly been delayed. A website that maps location and speed using data from Amtrak’s train tracker app showed the train was going 81.1 mph (129 kph) about a quarter of a mile from the point where it derailed, where the speed limit is significantly lower. US President Donald Trump tweeted that the incident shows "more than ever" why his infrastructure plan "must be approved quickly". However US media outlets pointed out his submitted federal transportation budget actually proposed cuts to funding to national rail systems.